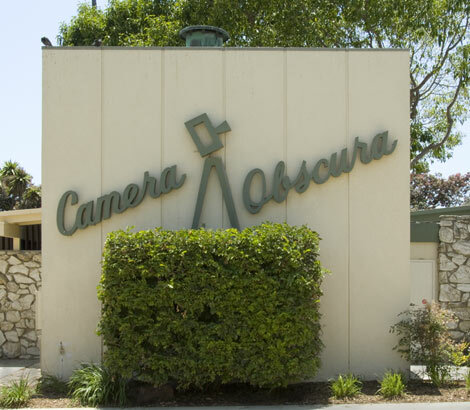 After years of hearing about the camera obscura on the sea front in Santa Monica, California we finally visited in 1998. This summer we paid a second visit. We traveled to Los Angeles on a delightful, all-day train trip from San Francisco after visiting the Giant Camera there. 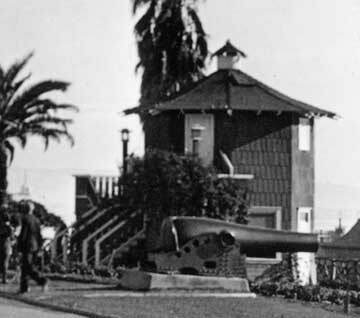 We know that the mechanism came from a turn of the century camera obscura next to the pier and was installed in the Senior Recreation Center in 1955. Images showing the camera obscura early in the 20th century are shown below. On the left is a picture of the square tower that contains the camera obscura with the image of a camera on a tripod and the words "Camera Obscura" in script. 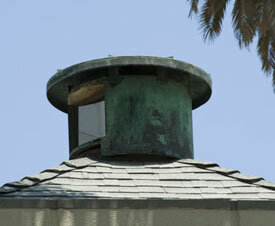 The turret that holds the lens and mirror can be seen at the center of the roof. We knew from our first visit that we should go to the office of the Senior Recreation Center, leave a driver's license, and receive a key to the camera obscura located up a flight of stairs. 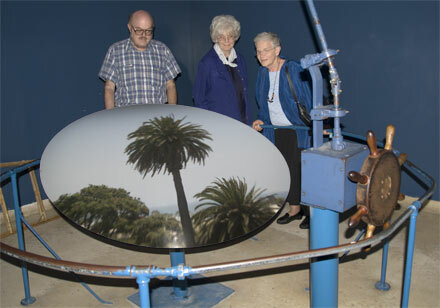 During our 1998 visit the mechanism that turns the lens turret was broken and only showed the image of one palm tree. We were happy to find that it was working perfectly on this trip. Inside the Santa Monica Camera Obscura, Beverly and our friends Dale and Louise look at the image on the table. This is a composite of a flash picture to show the interior and a non-flash to show the image on the table. The "ship's wheel" on the right of the table turns the lens turret 360°. Unlike some camera obscura tables, this one does not move up and down to focus but it can be tilted in any direction by grasping it on the edge and pressing down. This can improve the focus in some of the views. We knew both of these adjustments from talking to friends who had visited but there are no instructions posted. 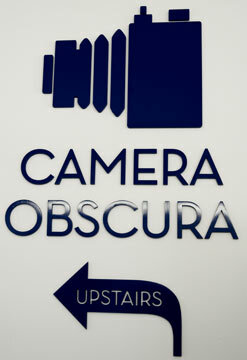 During the time we were in the camera obscura, observing and photographing, no one else came up the stairs to join us. It was a beautiful sunny day and the views were very clear. It seem a shame that this 100+ year old gem in a newer 50+ setting is not better known. After we left the camera obscura we had a surprisingly good seafood lunch on the pier and an enjoyable stole through the vendors and amusement rides. Even though the present location is not the same as the one that stood for many years on the Santa Monica beach the "heart" of the building is the same and it is very close to the spot where the original stood. For this reason we have chosen to include pictures of the earlier building here. 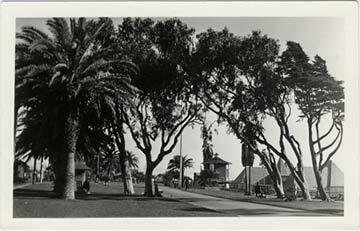 The sepia, card mounted photographs above of the beach in Santa Monica from the late 19th or early 20th centuries shows the camera obscura in the distance. It is a little under 4X5 inches. An enlargement of the image shows a man sitting on the steps of the camera, the cupola with lens at the top, and signs on the side. 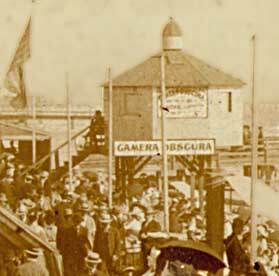 The beach camera obscura was moved and remodeled over the years. 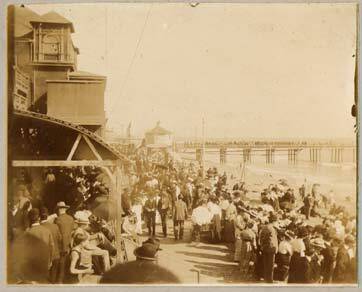 A later iteration is shown in the post card below. The postcard on the left is undated but the caption on the back says that the Camera Obscura was given to the city in 1907. The color is printed on the card but is certainly not "from nature" but applied to a black and white photograph. Wonder if the building was that shade of green? 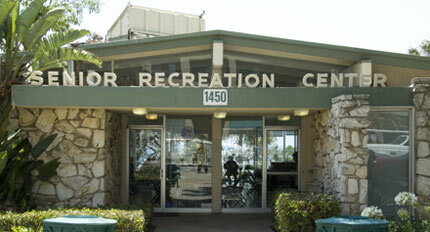 This building appears to be the location and color featured in the late 1940s, radio drama Quiet Please in an episode called Camera Obscura that describes the Santa Monica camera obscura as a green frame building on the beach. This episode is available as audio cassette SFH-423 from the Radio Showcase web site. Images of camera obscuras from our collection. Portable and box camera obscuras from our collection. Please read the Frequently Asked Questions before sending an e-mail. © Bright Bytes Studio. Do not use images without permission.